Chile’s long, slender silhouette stretches some 2,653 miles from the tropics of the north down into Patagonia and the icy fingertip of the continent. The country encompasses such diversity of geology and terrains that it holds a special appeal for nature lovers and adventurers. Immense ice fields and glaciers combine with the surreal granite spires of Torres Del Paine in Patagonia. The driest spot on earth, the Atacama Desert is home to fantastic moon-like topography, geysers, sculpted dunes and flamingo lagoons. The dazzling lakes and snowcapped volcanoes of the Lake District; and the hot springs, glaciers and temperate forests of the Carretera Austral invite exploration. The Magellan Strait opens to the wildlife lands of Tierra del Fuego and Cape Horn. 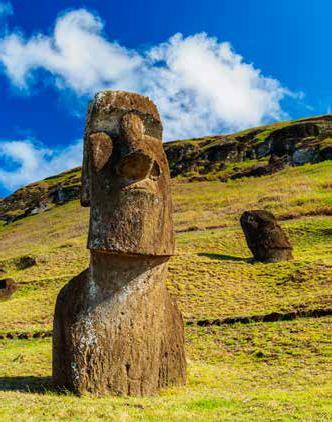 Some 2,300 miles offshore await the mysteries of the giant stone heads, moais, of Easter Island. Along with these stellar landscapes, Chile also boasts sophisticated cities such as its capital, Santiago. In a beautiful valley surrounded by snowy Andean peaks, the city is a wonderful base for exploring the country’s famous wine estates. 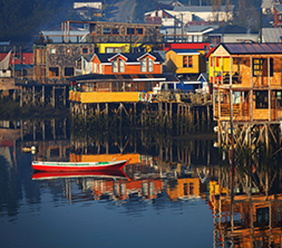 Chile appeals to city dwellers, nature lovers, sports enthusiasts and adventurers. Immense ice fields and glaciers combine with the surreal granite spires of Torres Del Paine in Patagonia. The driest spot on earth, the Atacama Desert is home to fantastic moon-like topography, geysers, sculpted dunes and flamingo lagoons. It is also one of the best locations on earth for star gazing. The Altiplano is freckled with lakes, marshes, salt flats, geysers, and 6,096-meter/20,000-foot volcanoes. The dazzling lakes and snowcapped volcanoes of the Lake District; and the hot springs, glaciers and temperate forests of the Carretera Austral invite exploration. The Magellan Strait opens to the wildlife lands of Tierra del Fuego and Cape Horn. The mysteries of the giant stone heads, moais, of Easter Island still provoke a myriad of questions. In a beautiful valley surrounded by snowy Andean peaks, sophisticated Santiago is a wonderful base for exploring historic wine estates. The country has also witnessed the struggle of its indigenous peoples to maintain their traditional customs. In the region of Pucon, you can still encounter the living heritage of the Mapuche peoples, who share a common social, religious and economic structure, as well as linguistic heritage. Luxury Chile travel pleases the connoisseur – be that of wines, mountaintops or traditions. I was surprised to see that the ice in Patagonia is blue. Patagonia’s Southern Ice Fields reveal themselves in lakes, canals and fjords. The scenery is a canvas of continually contrasting lights and shadows, where the mountains run into a sea that is dotted with islands. The land is furrowed yet nearly smooth as the winds and glaciers continue their slow work of pulverizing rocks, plowing out valleys and immense canals. Legendary navigators such as Ladrillero, Darwin and Fitz Roy came here long ago. I wonder if they saw the same blue ice chunks floating in the waters, glowing like a child’s nightlight? "Chile has one of the richest histories in Latin America. Yet, too often, I see the same few locations come up repeatedly. There is so much more to Chile than just ice and desert, right? I am happy to answer with a resounding yes. Imagine Chile before the bus tours, the hotels and the overcrowded spots. Now, imagine traveling to places where hidden luxury hotels sport names that you need to learn to pronounce with adventures you didn’t know were there. This is the Chile I fell in love with and want to share with you." Explore Chile with adventures ranging from a three-night cruise to one of the remotest corners of planet Earth, including Cape Horn National Park, to Patagonian Forest, to the traditional Mapuche communities, one of the oldest indigenous cultures in a country. Discover Northern Chile and travel through the unique landscapes and small villages of the Andes in Chile’s northern reaches; encounter ancient indigenous cultures; and take in fascinating ecosystems, from the Salar de Surire Natural Monument salt flat to Lauca National Park with its rich biodiversity.